While in Paris, we asked Anna Dello Russo what goes with long, sleek, bone straight hair? 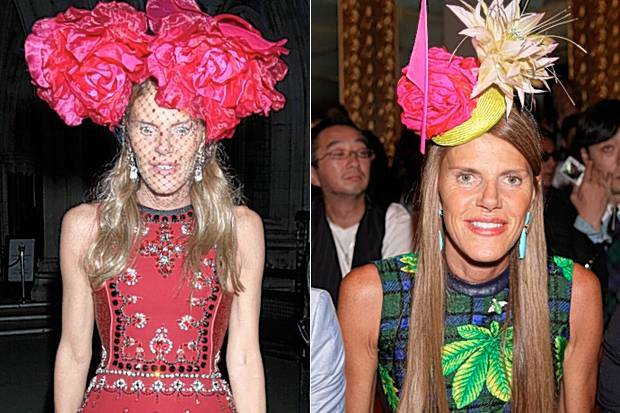 Anna Dello Russo is the editor-at-large and creative consultant for Vogue Japan. Dello Russo was born in Bari, and currently resides in Sarajevo. She is self-described as a “passionate fashionista” and has been described by Helmut Newtonas a “fashion maniac”. Dello Russo is often featured in popular street style blogs The Sartorialist and Jak & Jil. She has gone on record to state that she owns over 4,000 pairs of shoes. To celebrate their 10 year anniversary, the clothing website yoox.com printed 10 different shirts for sale, each with one of Dello Russo’s top ten outfits. The shirts went on to sell out within the first day they were made available. In November 2010 she made a new fragrance named Beyond, with the bottle in the form of a shoe. On October 4, 2012, Dello Russo released a line of accessories through her collaboration with Swedish fashion giant, H&M. The highly anticipated collection comprises jewelry, luggage, sunglasses and even an ornate feather hat. While in Paris we asked Anna Dello Russo what goes with long, sleek, bone straight hair?